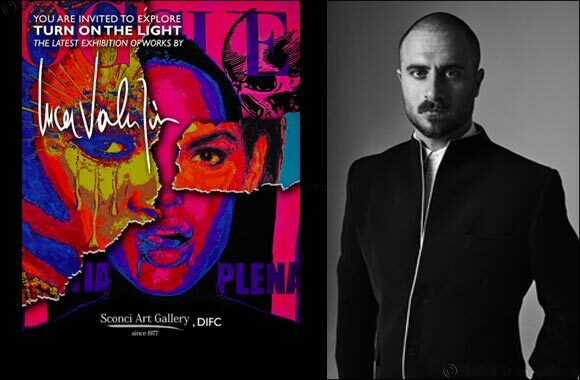 Dubai, UAE, April 09, 2019: Luca Valentini is pleased to present his latest exhibition, 'Turn on the Light', at Sconci Gallery, DIFC, launching on 8th April 2019 and running for three weeks. Within the collection, Valentini willo showcase 24 unique works, split into two series. The first series focuses on the reinterpretation of newspaper covers, movie posters and advertisements, while the second is inspired by Valentini's origins and reinterpreted in a modern way, placing the theme of social acceptance at the centre of his work. Valentini says his rationale for creating the first series emerged from wanting to offer a 'different point of view on what surrounds us, and towards that which we are used to seeing'. Inspired by covers of newspapers, advertisements and movie posters, Valentini sought, through puns, to change the meaning of images that are often part of his 'mnemonic baggage'. 'To emphasize the purely imaginary aspect of my work, I worked with pure bright colours, often phosphorescent. The strong contrasts of colour are marked by instinctive signs, which either go together or go in strong contrast with the underlying colour backgrounds. “The free gestures of colour reveal the passage of the brush. I have never been interested in a perfect piece of work, done to perfection. I find that imperfection is the concrete trace of the artist's unconscious. Therefore my portraits have become my way of “seeing”, becoming more alive and remaining true to the images from which I derived inspiration', Valentini said. 'I divided the protagonists of these operas into three well-defined classes: the rich as gods, who wear top brands; the middle class as mastini, under the orders of the gods; weak with the strong and strong with the weak; the poor as foxes, the same animal hunted for delight in the aristocracy of England. They turn their hopes of being socially acceptable to the brand, accepting the illusion that we are what we appear to be'. Speaking on his founding inspiration behind the collections, Valentini references 'the world in which he lives'. The artist advises that as a viewer, investing time in the artwork is key to adequate reflection and achieving a sense of meaning from a piece. 'My goal is to reflect, ironically, on some issues that characterize our times, and provoke an internal dialogue of thought', Valentini says. 'Black and white have given way to bright, shining colours; the matter to a flatter draft. The study behind every job is more complex, more cerebral. On the other hand, the instinctive and gestural traits remained the same. Now I feel much more mature, complete. For the first time, I feel free to fully express all my emotions and sensations on the canvas, without the fear of external judgment. The puns that have always characterized the reinterpretation of my covers have become more ironic and complex, contrasting in a more incisive way to the images represented', Valentini explains. On this basis, Valentini works with paint markers to give dynamism to the image. The sign left with the markers represents the most instinctive part of his work, 'more archaic', as he describes it. An image frozen at a certain moment comes to life with plays of light and shadows that do not follow any precise rule, 'in a controlled entropy'. Valentini's 'Turn on the Light' will be on display in Dubai, at the Sconci Gallery in DIFC and at the Avant Gallery in Miami for three weeks from 8th April 2019.